Yesterday I was talking on the telephone with a university colleague who lives at the base of Greenhorn Mountain in Rye, Colorado. Suddenly she started screaming and calling out for her husband to "get it." Was there a rattlesnake in her study? When she collected herself, she told me that a magpie had attacked and killed an oriole--an uncommon bird in that area--just outside her window. It is well known that magpies eat the eggs of other birds, and they sometime attack songbirds themselves, although not with a high success rate. In the United Kingdom, where songbird populations are dropping, magpies sometimes get part of the blame. Although I am no ornithologist, I wonder if attacking songbirds is learned behavior for some magpie populations. My parents lived from 1990-2002 in Colorado Springs, in a house with large ponderosa pine trees and some deciduous trees (mostly maples) around it. 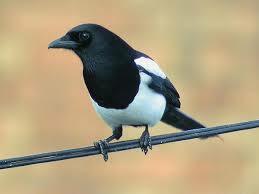 Magpies were frequently present and sometimes nested on the property. My dad fed the birds and kept binoculars and a field guide on the kitchen table. A retired man, he was often outdoors gardening as well. Yet he never reported a magpie attack on any of the songbirds that he attracted with his feeder. Had "his" magpies just never learned to do it?